Looking for college student grants? Looking for college student grants? They're out there! College student grants can come in a variety of different forms from a variety of different sources. Many of these are based from an organization or business who has an interest in a field of study. Others are from religious organizations, foundations, or trusts. Perhaps the most common kinds of grants for college students are from the government (like the Pell Grant and the National SMART Grant). College student grants are an incredible tool that you need to start utilizing if you aren't already! Student grants are usually based upon the financial needs of the recipient. Others can be based upon field of study, academic performance, or athletic ability. Either way, looking into grants for college students can save you thousands of dollars throughout your college career! What are college student grants? College student grants are an ideal way to pay for college. They are great because it is free money in the sense that you don't have to pay them back. There are many different kinds of grants. They come in state, federal, religious, ethnicity, minority, academic, athletic, and music types (only to name a few). Grants for college students can also come in differing amounts. Some might only be $100 and others might cover all of your tuition and books.It just depends which grants you apply for and receive. Something that is important to remember with college student grants is that they are not to be used to fund some sort of vacation or trip (unless that is a part of the terms of the grant like in a study abroad grant- make sure to check the terms). The National SMART Grant (a.k.a. the National Science and Mathematics Access to Retain Talen Grant) is a grant that can be used by juniors and seniors going into mathematics, critical foregin language, technology, non-single liberal arts, or science fields. A student in his or her third or fourth year of study can receive up to $4000 from this grant and it can be combined with a Pell Grant, not to exceed your cost of attendance. For more information about the National SMART Grant go to studentaid.ed.gov. As far as this webpage is concerned, we will be talking about Pell Grants, a type of government grant that you can receive by filling out the FAFSA. We will also cover how to find college student grants from organizations and businesses around the area of your university. When can I start applying for college student grants? The answer to the above question is the sooner the better. To get a Pell grant from the government you need to fill out the FAFSA. This is a yearly process, so anytime after the beginning of the year you can start filling out your applicaiton. You will want to do this (and as with any other grant application) as soon as you can! Thousands of students are applying, and who's to blame them. They want to get financial aid for college too. Financial aid is disbursed on a financial need basis and first come first served basis. So, as soon as you get all of your financial information ready for the fafsa(taxes, savings and investment accounts, etc. ), then fill it out! This of course goes for any other grant applicaiton you need to fill out. Find out which grants you want and can qualify for. Then fill them out and submit them. Even if you don't think you will qualify for them, fill them out anyway. Some students worry about the Expected Family Contribution (EFC) which is a calculated on the amount that helps determine the amount of financial aid awarded to you. Even, if you don't think you'll qualify, it doesn't hurt to try. Who can qualify for college student grants? Students who are enrolled at least at half-time status and have a significant financial need will qualify for college student grants. This is specifically true for the Pell grant. 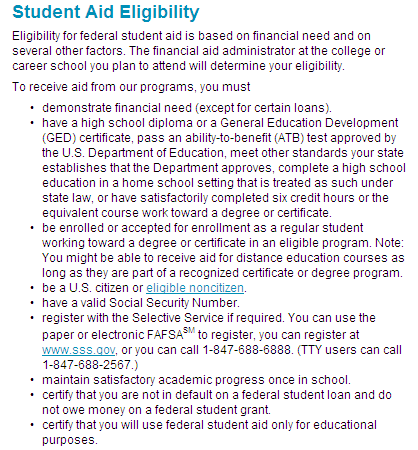 There are specific requirements at www.studentaid.ed.gov to get financial aid(including government grants). I have posted these below for your convenience. Students who meet these requirements will qualify for government grants. However, this doesn't mean that you will actually get them. It is absolutly important that you fill out your FAFSA as soon as you can so that you can get the grants that you want. The funding goes fast due to the number of applicants and financial needs of others. There are some grants that are merit based. You will know these when you find them by looking in the eligibilty section of the application or synopsis section of the grant. You should understand the "WHY" of grants after reading this far! They are free money! A real "no duh" decision! You don't have to pay these back like college student loans. Anyone who has been to college or even seen the tuition cost of college knows it's expensive! College student grants are a way to help soften the blow of the many expenses of college. Where and How can I Get College Student Grants? The first place to start in your search for grants for college students (after filling out the FAFSA, of course) is at your financial aid office. You can probably get the information you need over the phone, or you can talk to a counselor in person. The financial aid office will your number one resource about federal and state grants that are available to students. The financial aid office might even know of sponsoring organizations, businesses, foundations, and trust funds in the area who give grants to students at your school. If they don't, then look around town at businesses in the community. Take note of any big corporations, businesses, and organizations in the area. It is possible, since they are close to the university, that they give some sort of scholarship or grant. Try looking at the websites of these organizations or calling and asking the secretary if they have anything. Or, find out if there is someone you can talk to about financial aid for college students provided by their business or organization. Another place to look is around the school campus, especially in the student union building. Organizations that offer financial aid to students, such as the peace corps, may post in the student union building. The peace corps has an array of financial, professional, and educational benefits available to participating students, especially if you are seeking to do a masters or doctorate degree. In short, there are college student grants available for many situations and students. You can find grants based upon your ethnicity, religious affiliation, course of study, and sometimes even marital status. The easiest way to get a grant is to fill out your FAFSA. This is your quickest way to college student grants. Just remember when filling out your FAFSA that you need to do it as soon as you possibly can, just after the beginning of each year. Make sure to use studentaid.ed.gov to help you as you look for government financial aid. For more information about possible grants from your state or community, visit your financial aid office and ask for their help finding possible options based upon your situation. And finally, after you look for it, find it, and apply for it, then "rinse & repeat" (as much as you want)! Good luck in your search for college student grants. Finished with learning about college student grants? Get more information about federal student loans!